Mar 12, 2018 • NASA satellites are helping Wisconsin develop a clearer picture of its diverse and abundant fauna. Through a partnership project called Snapshot Wisconsin, scientists and managers are focusing on better wildlife management by linking spaceborne views with keen eyes on the ground. And that’s where the trail cameras come into play. A trail camera is a mounted, automated camera that captures an image, or sequence of images, when activated. Cameras can snap pictures at prescribed times or when sensors detect something moving in front of the camera. 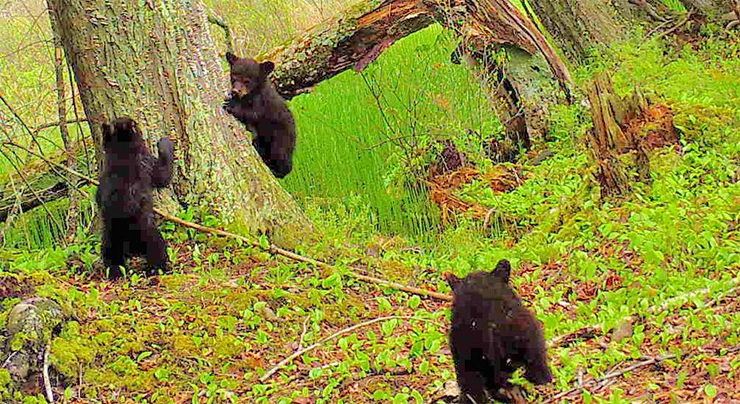 For the Snapshot Wisconsin project, more than 800 Wisconsinites have volunteered to set up and monitor nearly 1,000 trail cameras and upload their photos to the Zooniverse database—an online platform where citizen scientists provide data used by wildlife managers and professional researchers. Once the photos are in this database, anyone around the globe can help count and classify the species caught on camera— which means a birder in Bermuda or a hunter in Hungary can assist in Wisconsin’s wildlife management. Since its inception, the project has snapped more than 17 million photos and Zooniverse users have categorized about 250,000 valuable images of Wisconsin wildlife. In this repository, you can find photos of beavers, bobcats, badgers, and black bears. Snapshots of everything from a prickle of porcupines to grazing grouse and frolicking foxes can be seen here. The site has yet to archive a skunk taking a selfie (a smellfie? )— though it certainly seems that the occasional doe-eyed deer is posing for the camera. Ultimately, the project team hopes to have about 5,000 cameras dotting the state; an average of about 70 cameras per county. The team is acutely aware that trail cameras can only capture so much of Wisconsin’s 54,000 square miles of land. And snapshots alone can’t help the WDNR understand the environmental factors that determine the distribution and abundance of the state’s wildlife. With this fleet of NASA satellites and sensors now supporting the WDNR’s wildlife management, Clare reiterated, “The remote-sensing data has really improved our understanding of the distribution of certain species that might be difficult to study over large extents, and we’ve been able to identify certain environmental correlates that haven’t been previously well-established.” This added pair of eyes-in-the-sky is truly helping the WDNR make space for Wisconsin’s fauna. Read the full article on the NASA Science website. This entry is filed under Citizen Science, Ecosystems and Biodiversity, News.